You can configure the Smoothwall to send system logs to an external log server, automatically delete log files when disk space is low, and retain logs for a specified period. 1. Go to Reports > Logs > Log settings. Rotate the log file daily. Keep the last day. Rotate the log file daily. Keep the last two days. Rotate the log file weekly. Keep the last seven days. Rotate the log file weekly. Keep the last 14 days. Rotate the log file monthly. Keep the last 30 days. Rotate the log file monthly. Keep the last 60 days. Rotate the log file monthly. Keep the last 90 days. Rotate the log file monthly. Keep the last 120 days. Rotate the log file monthly. Keep the last 150 days. Rotate the log file monthly. Keep the last 180 days. Rotate the log file monthly. Keep the last 210 days. Rotate the log file monthly. Keep the last 240 days. Rotate the log file monthly. Keep the last 270 days. Rotate the log file monthly. Keep the last 300 days. Rotate the log file monthly. Keep the last 330 days. Rotate the log file monthly. Keep the last 365 days. • Retain IPsec logs — From the drop-down list, select the required retention period. To use the system retention period, select Default retention. • Retain Mail logs — From the drop-down list, select the required retention period. To use the system retention period, select Default retention. • Retain System logs — From the drop-down list, select the required retention period. To use the system retention period, select Default retention. 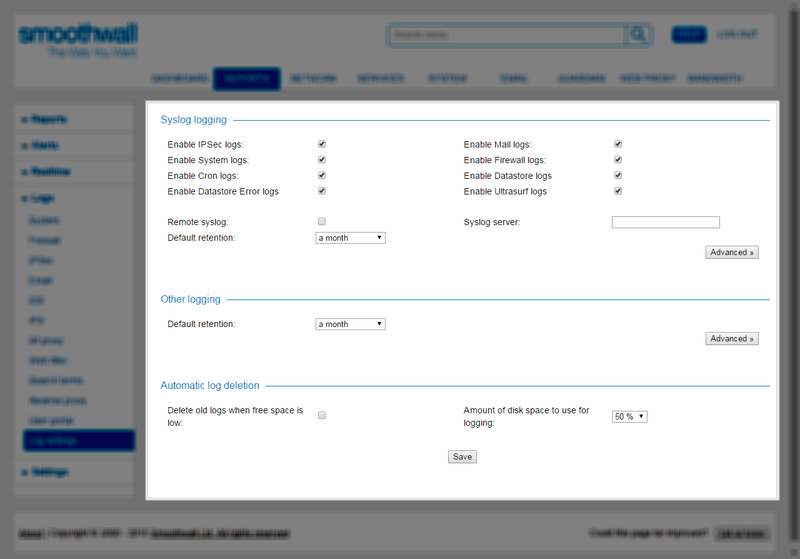 • Retain Firewall logs — From the drop-down list, select the required retention period. To use the system retention period, select Default retention. • Retain Cron logs — From the drop-down list, select the required retention period. To use the system retention period, select Default retention. • Retain Datastore logs — From the drop-down list, select the required retention period. To use the system retention period, select Default retention. • Retain Datastore Error logs — From the drop-down list, select the required retention period. To use the system retention period, select Default retention. • Default retention — From the drop-down list, select the required retention period. • Proxy access logs — From the drop-down list, select the required retention period. To use the system retention period, select Default retention. For more information, see Viewing Web Filter Logs. • Intrusion detection logs — From the drop-down list, select the required retention period. To use the system retention period, select Default retention. For more information, see Viewing IDS Logs. • Intrusion prevention logs — From the drop-down list, select the required retention period. To use the system retention period, select Default retention. For more information, see Viewing IPS Logs. • IM logs — From the drop-down list, select the required retention period. To use the system retention period, select Default retention. For more information, see Viewing IM Proxy Logs. • Reverse Proxy logs — From the drop-down list, select the required retention period. To use the system retention period, select Default retention. For more information, see Viewing Reverse Proxy Logs.